Is a Jewish Glasnost Coming to America? 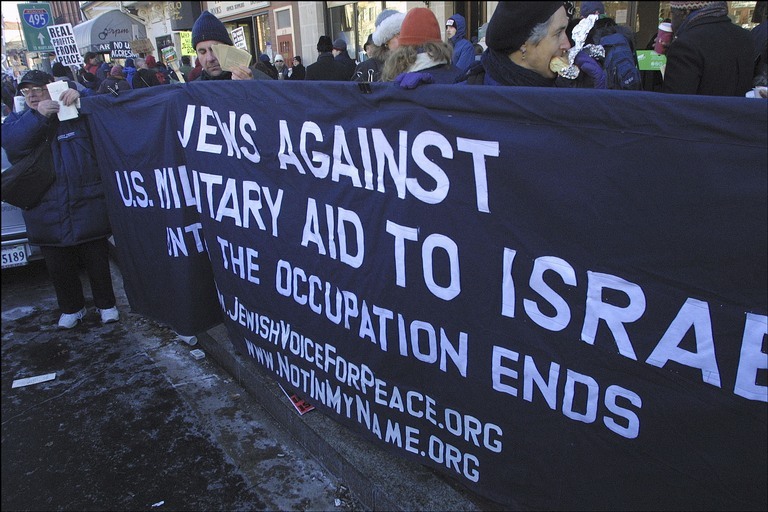 Anti-Israel protest in Washington, D.C., 2003. First, a confession: It may tell me that I hate myself, but I can’t help loving Masada2000, the website maintained by militant right-wing Zionist followers of Rabbi Meir Kahane. The reason I love it is its D.I.R.T. list – that’s "Dense anti-Israel Repugnant Traitors" (also published as the S.H.I.T. list of "Self-Hating and Israel-Threatening" Jews). And that’s not because I get a bigger entry than -- staying in the Ks -- Henry Kissinger, Michael Kinsley, Naomi Klein, or Ted Koppel. The Kahanists are a pretty flaky lot, counting everyone from Woody Allen to present Prime Minister Ehud Olmert on their list of Jewish traitors. But the habit of branding Jewish dissidents -- those of us who reject the nationalist notion that as Jews, our fate is tied to that of Israel, or the idea that our people’s historic suffering somehow exempts Israel from moral reproach for its abuses against others -- as "self-haters" is not unfamiliar to me. In 1981, my father went, as a delegate of the B’nai B’rith Jewish service organization, to a meeting of the Cape Town chapter of the Jewish Board of Deputies, the governing body of South Africa’s Jewish communal institutions. The topic of the meeting was "Anti-Semitism on Campus." My father was pretty shocked and deeply embarrassed when Exhibit A of this phenomenon turned out to be something I would published in a student newspaper condemning an Israeli raid on Lebanon. By then, I was an activist in the anti-apartheid movement in South Africa, which was consuming most of my energies. Having been an active, left-Zionist in my teenage years, I had, however, retained an interest in the Middle East -- and, of course, we all knew that Israel was the South African white apartheid regime’s most important ally, arming its security forces in defiance of a UN arms embargo. Even back then, the connection between the circumstances of black people under apartheid, and those of Palestinians under occupation in the West Bank and Gaza, seemed obvious enough to me and to many other Jews in the South African liberation movement: both were peoples harshly ruled over by a state that denied them the rights of citizenship. Still, this was a first. I could recite the kiddush from memory, sing old kibbutznik anthems and curse in Yiddish. I had been called a "bloody Jew" many times, but never an anti-Semite or a self-hating Jew. What quickly became clear to me, though, was the purpose of that "self-hating" smear -- to marginalize Jews who dissent from Zionism, the nationalist ideology of Jewish statehood, in order to warn others off expressing similar views. What I like about the S.H.I.T. list’s approach to the job -- other than the "Dangerous Minds" theme music that plays as you read it -- is the way it embraces literally thousands of names, including many of my favorite Jews. Memo to the sages at Masada2000: If you're trying to paint dissenters as demented traitors, you really have to keep the numbers down. Instead, Masada2000's inadvertent message is: "Think critically about Israel and you'll join Woody Allen and a cast of thousands..."
A New Landscape of Jewish Dissent. The Kahanists are a fringe movement, but their self-defeating list may nonetheless be a metaphor for the coming crisis in more mainstream nationalist efforts to police Jewish identity. The Zionist establishment has had remarkable success over the past half-century in convincing others that Israel and its supporters speak for, and represent, "the Jews." The value to their cause of making Israel indistinguishable from Jews at large is that it becomes a lot easier to shield Israel from reproach. It suggests, in the most emphatic terms, that serious criticism of Israel amounts to criticism of Jews. More than a millennium of violent Christian persecution of Jews, culminating in the Holocaust, has made many in the West rightly sensitive towards any claims of anti-Semitism, a sensitivity many Zionists like to exploit to gain a carte blanche exemption from criticism for a state they claim to be the very personification of Jewishness. So, despite Israel’s ongoing dispossession and oppression of the Palestinians in the occupied territories, then-Harvard president Larry Summers evidently had no trouble saying, in 2002, that harsh criticisms of Israel are "anti-Semitic in their effect if not in their intent." Robin Shepherd of the usually sensible British think-tank Chatham House has gone even further, arguing that comparing Israel with apartheid South Africa is "objective anti-Semitism." Says Shepherd: "Of course one can criticize Israel, but there is a litmus test, and that is when the critics begin using constant key references to South Africa and the Nazis, using terms such as ‘bantustans.’ None of these people, of course, will admit to being racist, but this kind of anti-Semitism is a much more sophisticated form of racism, and the kind of hate-filled rhetoric and imagery are on the same moral level as racism, so gross and distorted that they are defaming an entire people, since Israel is an essentially Jewish project." I would agree that the Nazi analogy is specious -- not only wrong but offensive in its intent, although not "racist." But the logic of suggesting it is "racist" to compare Israel to apartheid South Africa is simply bizarre. What if Israel objectively behaves like apartheid South Africa? What then? Actually, Mr. Shepherd, I’d be more inclined to pin the racist label on anyone who conflates the world’s 13 million Jews with a country in which 8.2 million of them -- almost two thirds -- have chosen not to live. Although you wouldn't know it -- not if you followed Jewish life simply through the activities of such major Jewish communal bodies as the Conference of Presidents of American Jewish Organizations and the Anti-Defamation League -- the extent to which the eight million Jews of the Diaspora identify with Israel is increasingly open to question (much to the horror of the Zionist-oriented Jewish establishment). In a recent study funded by the Andrea and Charles Bronfman Philanthropies (an important donor to Jewish communal organizations), Professors Steven M. Cohen and Ari Y. Kelman revealed that their survey data had yielded some extraordinary findings: In order to measure the depth of attachment of American Jews to Israel, the researchers asked whether respondents would consider the destruction of the State of Israel a "personal tragedy." Less than half of those aged under 35 answered "yes" and only 54% percent of those aged 35-50 agreed (compared with 78% of those over 65). The study found that only 54% of those under 35 felt comfortable with the very idea of a Jewish state. As groups such as the Jewish Agency in Israel (which aims to promote Jewish immigration) and the American Jewish committee expressed dismay over the findings, Cohen and Kelman had more bad news: They believed they were seeing a long-term trend that was unlikely to be reversed, as each generation of American Jews becomes even more integrated into the American mainstream than its parents and grandparents had been. The study, said Cohen, reflected "very significant shifts that have been occurring in what it means to be a Jew." Cohen’s and Kelman’s startling figures alone underscore the absurdity of Shepherd’s suggestion that to challenge Israel is to "defame an entire people." They also help frame the context for what I would call an emerging Jewish glasnost in which Jewish critics of Israel are increasingly willing to make themselves known. When I arrived in the United States 13 years ago, I was often surprised to find that people with whom I seemed to share a progressive, cosmopolitan worldview would suddenly morph into raging ultranationalists when the conversation turned to Israel. Back then, it would have seemed unthinkable for historian Tony Judt to advocate a binational state for Israelis and Palestinians or for Washington Post columnist Richard Cohen to write that "Israel itself is a mistake. It is an honest mistake, a well-intentioned mistake, a mistake for which no one is culpable, but the idea of creating a nation of European Jews in an area of Arab Muslims (and some Christians) has produced a century of warfare and terrorism of the sort we are seeing now." Unthinkable, too, was the angry renunciation of Zionism by Avrum Burg, former speaker of Israel's Knesset. And, in those days, with the internet still in its infancy, the online Jewish dissident landscape that today ranges from groups in the Zionist peace camp like Tikkun, Americans for Peace Now, and the Israel Policy Forum, among others, to anti-Zionist Jews of the left such as Not in My Name and Jewish Voices for Peace, had not yet taken shape. Indeed, there was no Haaretz online English edition in which the reality of Israel was being candidly reported and debated in terms that would still be deemed heretical in much of the U.S. media. Clearly, much has changed, and the ability of the Zionist establishment -- the America Israel Political Action Committee, the American Jewish Committee, the Anti-Defamation League, and others -- to impose nationalist boundaries on Jewish identity is being eroded. It is worth remembering in this context that anti-Zionism was originally a Jewish movement -- the majority of European Jews before World War II rejected the Zionist movement and its calls for a mass migration from Europe to build a Jewish nation-state in Palestine. The most popular Jewish political organization in Europe had been the Yiddishe Arbeiter Bund, a Jewish socialist party that was militantly anti-Zionist. Even among the rabbis of Europe, there was considerable opposition to the idea of Jews taking control of Zion before the arrival of the Messiah (and there still is, of course, from a sizable minority of the ultra-Orthodox). Of course, the Holocaust changed all that. For hundreds of thousands of survivors, a safe haven in Palestine became a historic necessity. But the world has changed since then, and as the research cited above suggests, the trends clearly do not favor the Zionists. I was reared on the idea that a Jewish nation-state in the Middle East was the "manifest destiny" of the Jews. I learned in the Zionist movement that Jewish life in the Diaspora was inevitably stunted and ultimately doomed. But history may have decided otherwise. The majority of us have chosen to live elsewhere, thereby voting with our feet. Indeed, according to Israeli government figures, some 750,000 Israeli Jews (15% of Israel’s Jewish population) are now living abroad, further undermining the Zionist premise that the Diaspora is an innately hostile and anti-Semitic place. The Ferocity of Nationalism, The Universality of Justice. Increasingly anxious that most of us have no intention of going to Israel to boost Jewish numbers, the Israel-based Jewish Agency -- apparently oblivious to the irony of its own actions -- has complained to Germany over official policies that make life there so attractive to Jewish immigrants from former Soviet territories, thus discouraging them from going to Israel. More immediately threatening to the Zionist establishment, however, is another reality: Many Jews are beginning to make once unthinkable criticisms of Israel’s behavior. If you want to bludgeon Jewish critics with the charge of "anti-Semitism" when they challenge Israel's actions, then it is hardly helpful to have other Jews standing up and expressing the same thoughts. It undermines the sense, treasured by Israel’s most fervent advocates, that they represent a cast-iron consensus among American Jews in particular. That much has been clear in the response to the publication of John Mearsheimer and Steven Walt’s controversial new book The Israeli Lobby and U.S. Foreign Policy, which challenges the wisdom and morality of the unashamed and absolute bias in U.S. foreign policy towards Israel. In an exchange on the NPR show Fresh Air, Walt was at pains to stress, as in his book, that the Israel Lobby, as he sees it, is not a Jewish lobby, but rather an association of groupings with a right-wing political agenda often at odds with majority American-Jewish opinion. Abe Foxman of the Anti-Defamation League, argued exactly the opposite: Walt and Mearsheimer, he claimed, were effectively promoting anti-Semitism, because the Israel lobby is nothing more (or less) than the collective will of the American Jewish community. Which, of course, it isn’t. In fact, in the American Jewish community you can increasingly hear open echoes of Mearsheimer and Walt’s skepticism over whether the lobby’s efforts are good for Israel. But Foxman’s case is undercut by something far broader -- an emerging Jewish glasnost. Of course, like any break with a long-established nationalist consensus, the burgeoning of dissent has provoked a backlash. Norman Finkelstein -- the noted Holocaust scholar and fierce critic of Zionism recently hounded out of De Paul University in a campaign of vilification based precisely on the idea that fierce criticism of Israel is the equivalent of "hate speech" -- could be forgiven for being skeptical of the idea that the grip of the ultranationalists is weakening. Jimmy Carter -- who was called a "Holocaust denier" (yes, a Holocaust denier!) for using the apartheid analogy in his book on Israel -- and Mearsheimer and Walt might have reason for skepticism as well. But I would argue that the renewed ferocity of recent attacks on those who have strayed from the nationalist straight and narrow has been a product of panic in the Jewish establishment -- a panic born of the fact that its losing its grip. As in the former Soviet Union with the actual glasnost moment, this is a process, once started, that's only likely to be accelerated by such witch-hunting. Last year, a very cranky academic by the name of Alvin Rosenfeld, on behalf of the oldest Jewish advocacy group in the U.S., the American Jewish Committee, got a flurry of attention by warning that liberal Jews such as playwright Tony Kushner, Tony Judt and Richard Cohen, all of whom had recently offered fundamental criticisms of Israel, were giving comfort to a "new anti-Semitism." "They're helping to make [anti-Semitic] views about the Jewish state respectable -- for example, that it is a Nazi-like state, comparable to South African apartheid; that it engages in ethnic cleansing and genocide. These charges are not true and can have the effect of delegitimizing Israel." In reality, though, whether or not you agree with the views of those critics, they simply cannot legitimately be called anti-Semitic. Actually, I doubt any of those he cited have accused Israel of genocide or compared it in any way to the Nazi state. (Former Israeli Knesset Speaker Avram Burg, however, recently did write, in reference to Israeli militarism and hostility to Arabs, "It is sometimes difficult for me to distinguish between the primeval National-Socialism and some national cultural doctrines of the here-and-now."). But the ethnic-cleansing in which the Israelis expelled 750,000 Palestinians in 1948 and the apartheid character of Israel's present occupation of the West Bank are objective realities. Rosenfeld is suggesting that, to take an honest look at either the occupation or the events of 1948, as so many Israeli writers, journalists, and politicians have done, is to "delegitimize" Israel and promote anti-Semitism. Use of the term "apartheid" in reference to the occupation does draw the attention of those who prefer to look away from the fact that Israel is routinely engaged in behavior democratic society has deemed morally odious and unacceptable when it has occurred in other contexts. It is precisely because that fact makes them uncomfortable, I suspect, that they react so emotionally to the A-word. Take black South Africans who suffered under apartheid on a visit to the West Bank -- a mild-mannered moderate Nobel Peace Prize winner such as Bishop Desmond Tutu, for example -- ask them about the validity of the comparison, and you know the answer you are going to get. Moreover, it is an answer with which a growing number of Jews, who place the universal, ethical and social justice traditions of their faith above those of narrow tribalism, are willing to deal. 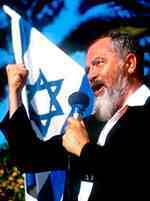 In an earlier commentary, perhaps presaging his break with Zionism, Burg noted in 2002: "Yes, we Israelis have revived the Hebrew language, created a marvelous theater and a strong national currency. Our Jewish minds are as sharp as ever. We are traded on the Nasdaq. But is this why we created a state? The Jewish people did not survive for two millennia in order to pioneer new weaponry, computer security programs or antimissile missiles. We were supposed to be a light unto the nations. In this we have failed. It turns out that the 2,000-year struggle for Jewish survival comes down to a state of settlements, run by an amoral clique of corrupt lawbreakers who are deaf both to their citizens and to their enemies. A state lacking justice cannot survive. More and more Israelis are coming to understand this as they ask their children where they expect to live in 25 years. Children who are honest admit, to their parents' shock, that they do not know." Although I am not religious, I share Burg's view that universal justice is at the heart of the Jewish tradition. Growing up in apartheid South Africa was an object lesson in Jewish ethics. Yes, there was plenty of anti-Semitism in the colonial white society of my childhood, but the mantle of victimhood belonged to others. And if you responded to the in-no-way-exclusively-so, but very Jewish impulse to seek justice, you found yourself working side by side not only with the remarkable number of Jews who filled leadership roles in the liberation movement, but also with Christians, Muslims, Hindus, and others. Judaism’s universal ethical calling can’t really be answered if we live only among ourselves -- and Israel’s own experience suggests it's essentially impossible to do so without doing injustice to others. Israel is only 59 years old, a brief moment in the sweep of Jewish history, and I'd argue that Judaism’s survival depends instead on its ability to offer a sustaining moral and ethical anchor in a world where the concepts of nation and nationality are in decline (but the ferocity of nationalism may not be). Israel’s relevance to Judaism’s survival depends first and foremost on its ability, as Burg points out, to deliver justice, not only to its citizens, but to those it has hurt. Tony Karon is a senior editor at TIME who also maintains his own website, Rootless Cosmopolitan, where he comments on everything from geopolitical conflict to Jewish identity issues. Reprinted courtesy of TomDispatch.com.